Send Special Birthday Cake - 1 Kg. to Chennai. Gifts to Chennai. Send Cakes to Chennai. Special Birthday Cake - 1 Kg. Description : Birthdays are always one of the most awaited occasions. This is a creamy delight for your loved ones in Chennai on their Birthdays. With happy Birthday written on it, this Vanilla cake from Five star bekary is baked with the most exclusive ingredients and it has a beautiful taste. 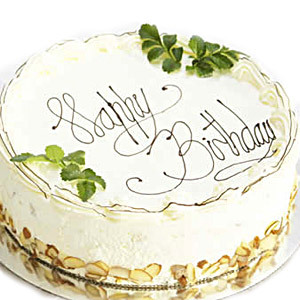 Send this Fresh Vanilla Birthady cake to your friends and family through Gift2Chennai.com along with other Gifts to Chennai. Weight : 1 Kg. Please note : Picture is indicative. The actual shape of the cake might differ according to availability.